I suddenly began to wonder about these verses. I am raised with Christ, hidden with Christ in God? What are the things that are above that I should seek? What is it upon which I should set my mind—things that are not on earth? And then, how shall I live as a person whose life is Christ with whom I shall live in glory? In the silence of my meditation, what came to my mind was the vision of Revelation and heaven, the paradise of God’s presence and new creation (Revelation 21-22). I thought about the elements revealed in that vision and the characteristics of the Lord that emanate into and fill his kingdom. I considered those things that are sourced in God and contrast the fallen world. Sometimes, we Christians, can act like the Israelites under the leadership of the prophet Samuel. We want to be like the other nations of the world. We don’t want Yahweh; we want an earthly king to lead us in battle and achieve the spoils of the world. This is no small matter to the Lord who consoles Samuel, “They have not rejected you, but they have rejected me from being king over them.” (1 Samuel 8:7) We want a kingdom rooted in the world. So, as I meditated on the things above, I pictured the kingdom of heaven, a paradise where the throne of God and the Lamb of God are the center and the light. I imagined my thirst being quenched with the streams of the water of life. I saw myself breathing in the air generated by the leaves of the tree of life that are for the healing of the nations. I set my mind on tasting the fruit of the tree of life in the paradise of God. I asked the Lord to shine on me with his light that lightens his dwelling place where I am in Christ. I invited the Lord to remove from me all that is evil, dark and causes pain or regret. I pleaded for the Lord to cleanse me from all unrighteousness. It is from this kingdom on high that Jesus promises his followers the power of the Holy Spirit. I asked God for the fruit and power of the Spirit. I invited the Holy Spirit to sanctify me with truth that is his presence and the word of God. I asked God to fill me with his healing, restorative life and to cure me of all ills, sickness and diseases—all that would cause pain or tears and is not in heaven. There is no completion to this effort of grace for a disciple of the Lord, until Jesus comes in glory, and we appear with him. I asked the Lord to help me walk in love according to the reality of his kingdom, so that I could truly live as an ambassador of this kingdom and its king—Jesus Christ. This is a practice that I feel compelled to repeat. I think it is a practice of living into our life as citizens of heaven that is the coming kingdom in which all will conform to the Father’s will. I have heard the quips like, “You can become so heavenly minded that you are no earthly good.” I think this sort of thought misses the point of the gospel and the teaching of Jesus and the New Testament authors. One day, the entire earth will be heavenly minded. Jesus did what he did because he was heavenly minded. He was establishing the kingdom of heaven on earth. Christians still misinterpret this verse based on the King James Version of the Bible using the word “mansions” for the Greek word mone that translates to a “dwelling place” or “abode” rather than a huge house of the rich, as we have come to understand “mansion” in modern English. In this same conversation, Jesus uses mone again regarding the Spirit of God residing in believers, “If anyone loves me, he will keep my word, and my Father will love him, and we will come to him and make our home with him.” (John 14:23) Jesus is indicating an intimate relationship with God in his presence. In the Father’s house, his dwelling place, there is room for everyone through Jesus. He is going before us and making a way for us. In fact, Jesus tells his disciples that he is “the way” and the only way to the Father’s house and to intimacy with him. We can read this as Jesus going before us into God’s kingdom and making a room for us there; however, I think Jesus might be speaking preparing a place for us with the Father by going to his death on the cross. His statement, “I go to prepare a place for you,” precedes Jesus going out from them to his death. There on the cross our place of peace with God is made. Such a man as Stephen clearly demonstrates the power, love, joy, righteousness and peace of the kingdom of heaven. The Lord is present with him and working wonders through him. When questioned by the council, Stephen gives a lengthy exhortative narrative of God’s redemptive-salvation beginning with the call of Abraham to the death and resurrection of Jesus. If we did not know the rest of the story and how this ends for Stephen, I think we would surely imagine that the Spirit would fall and overwhelm the audience. I would imagine that in the midst of the shaking of the building they would come to repentance or flee in fear of the Lord who was with Stephen. That is not what happens. 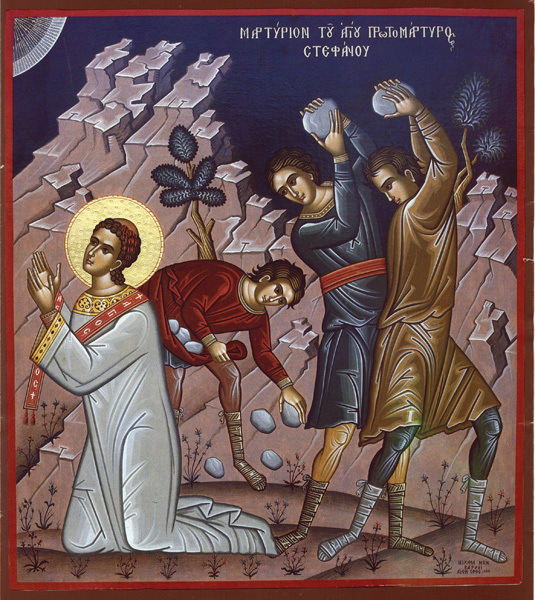 The story continues, “Now when they heard these things they were enraged, and they ground their teeth at him,” and they drag him out of the city and stone him to death. The Lord of Hosts with his heavenly army did not rescue Stephen or come down and appear to everyone in his ascended glory. Luke’s description of Stephen assures readers that the Lord was present with Stephen in the Holy Spirit. Stephen’s vision of heaven confirms that his mind and heart were already set on heaven and the kingdom of God. The sight of Jesus and the throne of God confirms Stephen’s place in the “Father’s House.” Stephen was already living in the kingdom of God as an ambassador of Christ before his death. When he died, he went to the place prepared for him by Jesus. That is how we can live while awaiting the appearing of Jesus. Stephen, a mere fallen-redeemed human like you and me did great works in Jesus’ name. This is what Jesus promises his disciples in his conversation, “Whoever believes in me will also do the works that I do; and greater works than these will he do, because I am going to the Father.” (14:12) The way to do such works is to keep our minds and hearts on Jesus and on things above in the kingdom of heaven. These works may be miracles and healings, but the greatest work of Jesus was his self-giving sacrifice on the cross. We, too, in following him can do no greater work than give ourselves for the sake of others, as God has gifted us to serve . The meditations on the kingdom of heaven do not lead to passive daydreaming. Rather, envisioning heaven, by the inspiration of Scripture and the Holy Spirit, empowers active kingdom living to the glory of God. I believe that this passage of Scripture reveals the essence of the gospel. God has inspired Luke to write this passage as an historical narrative of the actual events that occurred and also as an instructive narrative for our Christian lives. Luke begins this passage by placing it in the context of the day of Jesus’ resurrection. That “very” or “same” day, the day itself, that was known as the “Lord’s day” to the early church. This was no ordinary day. Luke has already shared the events at the empty tomb that will be summarized by these two disciples leaving Jerusalem. This passage is often described as “The Road to Emmaus.” Luke tells us that two of the disciples were traveling the seven-mile road from Jerusalem to Emmaus. Why would two of Jesus’ disciples be leaving Jerusalem and the rest of the disciples on the very day Jesus has risen to life? The answer is simple—they believed Jesus was still dead. It seems reasonable to think that they were headed home. We know one of these disciples is named Clopas. The other could be another man or his wife. Luke’s Clopas might be the same man called “Cleopas” by John in John 19:25 where he names “Mary the wife of Cleopas” as one of the women who watched at the cross with Jesus’ mother Mary. Luke describes the two walking along the road discussing “with each other all these things that have happened.” I believe they were perplexed, confused, bewildered, disillusioned and distraught. They will confess to the unrecognized Jesus that their hopes have been dashed by his death. They admit to being discombobulated by the “idle tales” of the women’s reports of angels and the resurrection. These two are beside themselves. In this state of disorientation, they seem to be seeking refuge by going home and returning to a place of comfort in this world. This is reflective of our lives. Imagine when you are anxious, worried, fearful, confused and don’t know what to do or where to go—when God has not met your expectations. Whether you are bored or stressed, disappointed or nervous, don’t you want to find comfort? When your hopes are apparently dashed, the vision of faith is cracked, and you seek security where you have been before. You may turn away from God’s call into the sin that “clings so closely.” (Hebrews 12:1) This might be an addiction, an unhealthy relationship, a sinful habit like gossip or accusations, rebellion against God, or binging on something appealing. You may fall into depression and despair while isolating yourself from others who care about you. You may ignore God and walk or drift away. These two disciples’ hearts, like ours can become, have become closed to hope in the face of the crucifixion of Jesus on whom their hopes had been set. They do not know the rest of the story. 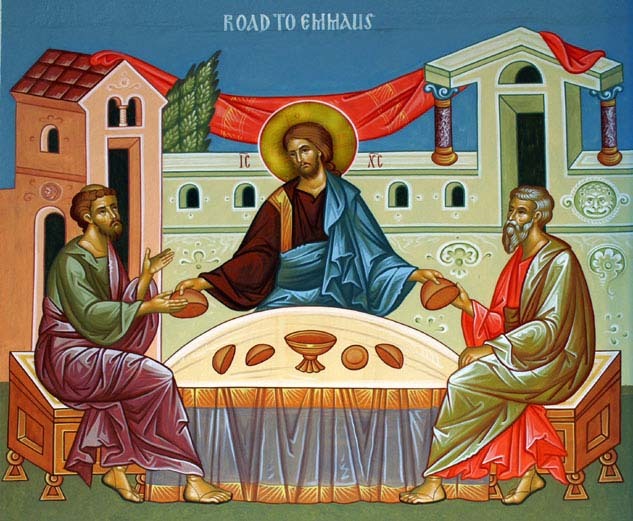 What happens to these two disciples on the Road to Emmaus can happen to us on our figurative Roads to Emmaus. What the Lord reveals in this narrative is the pattern of the Christian life for all time in this world. What occurs here can occur for us today. Look at the response to Jesus’ question. I love this. The two disciples actually stop walking, “they stood still looking sad.” With a question, Jesus literally arrests the movement of their lives. In his play, The Rock, T. S. Eliot has a wise character warn, “Oh my soul, be prepared for the coming of the Stranger. Be prepared for him who knows how to ask questions.” Remember, Jesus has come as a stranger. His identity is hidden from these two disciples, and he knows how to ask questions. Their response to Jesus mirrors a confession for themselves and the people of Israel. They confess to what they believe were their misplaced hopes that Jesus was the Messiah. They confess the wickedness of the Jewish and Roman leaders in putting Jesus to death. They confess the outlandishness of the women’s tale of the angels and resurrection. They don’t mention it, but we know from the later text and from Paul’s account in 1 Corinthians 15:5 that Peter has also seen the risen Lord by this time. They also don’t believe him but apparently don’t want to besmirch him by including his “idle tale” with the women’s. The Psalmist writes that “The fool says in his heart, ‘There is no God.’” (Psalm 14:1) Jesus knows this Psalm, and he is indicating that they are acting like God is not real and alive. He points to their unbelief of the promises and truth of the Scriptures of God. If we are honest with ourselves, our negative states of being flow from our unbelief in the promises and truths revealed in Scripture. How foolish we are and slow of heart to believe in the victory and salvation of God in our lives at any given moment. What does Jesus do next? He doesn’t punish them or condemn them or belittle them. He “instructs them in the Scriptures.” The Lord turns us to the words of life in the Bible. Contemporary Christians have got to get over the lies of our culture that would convince us the Bible is quaint or fiction. We have to get over our pride thinking we have evolved beyond the simple Christians of the past who “idolized” Scripture as authoritative. We also have to reject our silly notion that we “know” the Bible, and it can’t help us now. And we definitely need to discipline ourselves to stop thinking we have better things to do with our time than read Scripture. Luke gives us a firm message…when Jesus preaches, he uses Scripture. When Jesus wants you to know something for your life, he uses Scripture. When Jesus wants to confront your error and instruct you and counsel you in the way to go forward, he uses Scripture. Shame on us for our thinking that we are above and beyond the need to become equally obsessed with Scripture. The effect of Jesus preaching Jesus from the Scriptures is the burning of the disciples’ hearts. Their hearts are set aflame with the fruit of the Spirit in the presence of Jesus and the word. Has this happened to you? Has it happened this week? This is not just a historical account; I believe this is descriptive of a disciple of Jesus interacting with Scripture in the presence and sovereignty of the Holy Spirit. Open the Scriptures and invite the Lord to engage you. Paul writes, “Faith comes through hearing and hearing through the word of Christ.” (Romans 10:17) Our hearts burning with faith and filling with the fruit of the Spirit may not be constant, but I believe it can be a normative effect of our Christian devotion. Luke uses the term “breaking of the bread” three times in Acts to describe what I think the early church had by this time come to recognize as the Eucharistic meal of Holy Communion. (Acts 2:42-45; 20:7 & 27:35-36). This is a poignant phrase with particular sacramental meaning for Luke’s original audience. As often as we gather as Christ’s body and sacramentally bless, break and share the bread that is his body, he is also present to be revealed in the breaking of the bread. Luke overtly emphasizes the relevance and priority of Scripture and Holy Communion in the life of the church. Transformation comes for these two disciples and Christians today through the interaction with Scripture and the Eucharist in the presence of the Spirit of Christ. Our hearts are transformed, our eyes are opened and our lives are changed. Look at how Cleopas and his friend or wife respond to the revelation of Jesus. They immediately rose and retraced their steps along the seven-mile trek to Jerusalem—despite nightfall. They turned around; in other words, they repented! They repented of their wrong headedness and unbelief. They found the eleven apostles and those with them and declared boldly the gospel of Jesus Christ, “The Lord has risen indeed!” They share what has happened and how Jesus was revealed. Their despair has turned to hope; their unbelief has been replaced by faith and assurance; their disorientation has been exchanged by truth and vision. Fear has been cast out by bold confidence. They have truly become ambassadors of Jesus Christ and his kingdom. This demonstrates the goal of the Christian life: to experience the risen Lord Jesus and to proclaim his gospel. No matter how negative our state of being is today, we can experience transformation. Invite the Lord to walk along with you. Invite him to speak through the Scriptures. Participate in the Lord’s Supper of Holy Communion with the body of Christ, the church, and let Jesus be revealed to you. Ask the Holy Spirit to set your life on the right path and give you such an experience with him that you cannot help but tell others what has happened on your road. I believe that you will see outcomes, as the two disciples did, “As they were talking about these things, Jesus himself stood among them, and said to them, ‘Peace to you!’” We are not alone in our endeavors to proclaim the gospel and serve Jesus. He is present. When we take steps of faith in sharing about the risen Jesus, we will find Jesus shows up and expresses his love in the fruit and gifts of his Spirit. He is present to open hearts, minds and eyes to see. How exciting to be his ambassador.